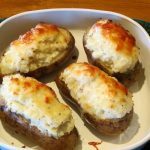 Twice baked potatoes are a lot of fun and a recipe that you can easily change up with different flavors and toppings so after you get the basics down, get creative. Food should not only be good, it should be fun! Here in Aroostook County, potatoes are big business and a way of life. We have enormous commercial potato farms so the availability of the “spud” is plentiful to say the least. Over the years of living here I have developed a ton of potato recipes. Potatoes…….they’re what’s for dinner! Twice-Baked Potatoes hot from the oven! Wash and dry your potatoes with paper towel. Rub each potato with garlic oil and then sprinkle with salt and paper. In a foil lined roasting pan, bake the russet potatoes in a 350 oven for 1 hour. 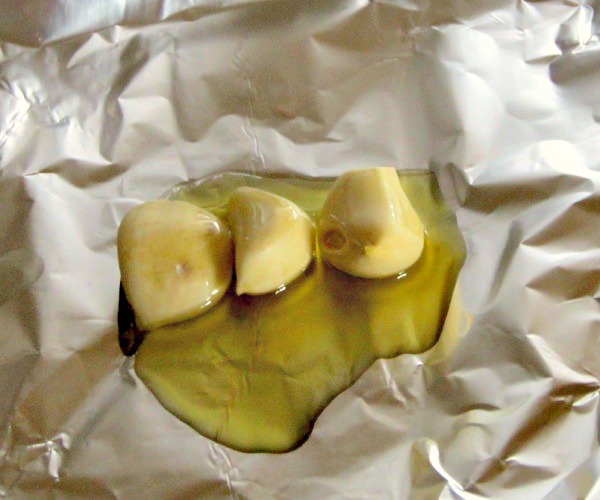 Peel the 3 cloves of garlic and wrap them with olive oil in a foil pouch. Place in oven with potatoes. Let the garlic roast for about 20 minutes and remove. Let the garlic cool while potatoes continue cooking. When the potatoes are done let them cool for 20 minutes so they can be handled. Cutting lengthwise, slice off the top third of the potato and set aside. With a sharp spoon hollow out the potato, leaving a quarter inch shell. 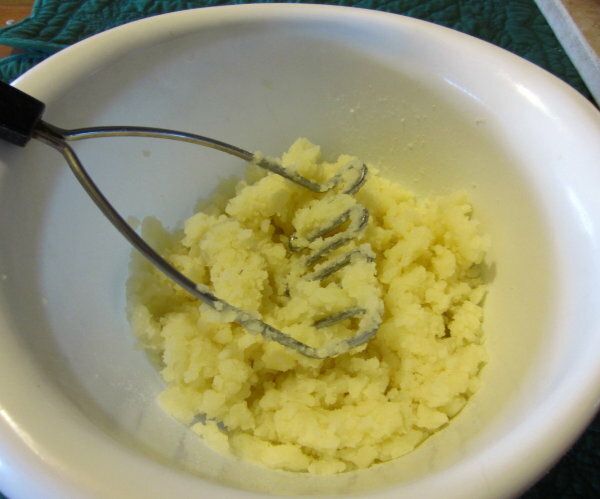 Do the same to the top third of the potato and add that pulp to that from the main body in a medium sized mixing bowl. 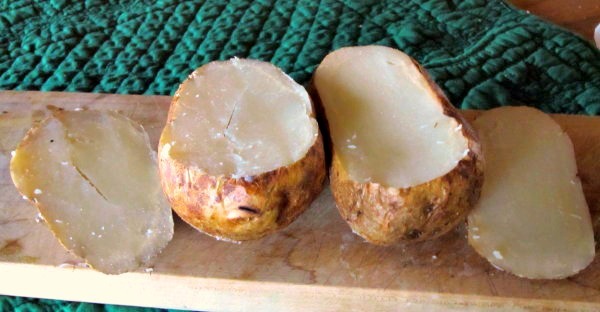 The skin from the top third can be kept and used for potato skin appetizers at another meal. Potatoes with pulp scooped out ready for stuffing with pulp mixture. 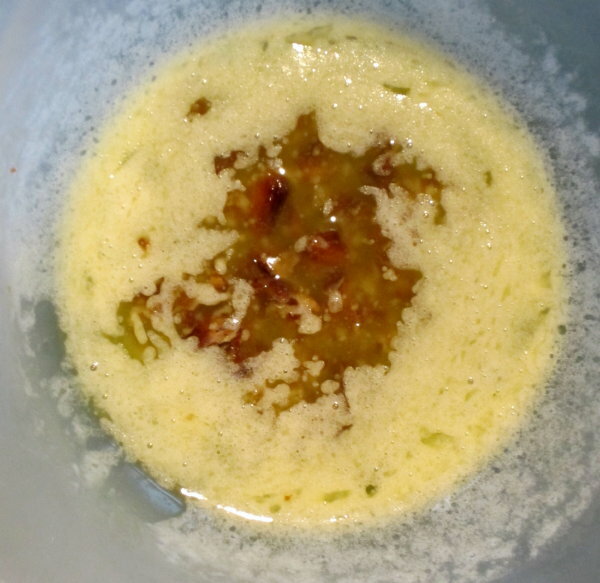 Finely mince the roasted garlic cloves and put in a small microwavable bowl with butter. Melt butter in microwave. 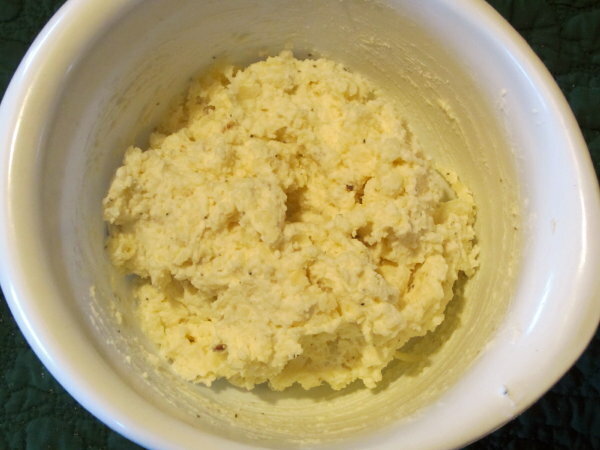 Melt butter in microwave with finely minced roasted garlic. 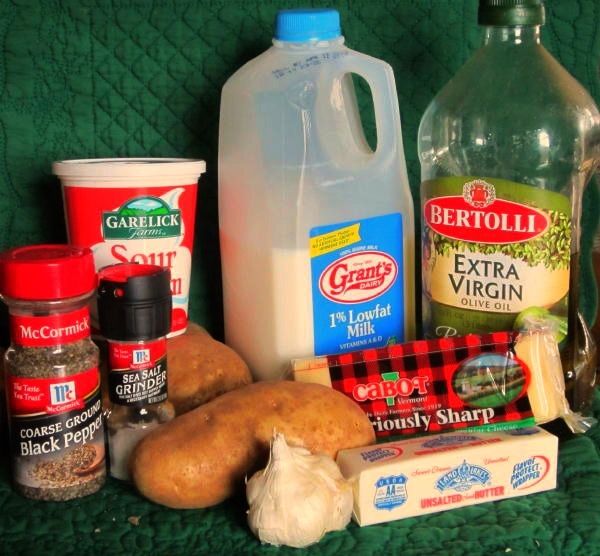 Add melted butter, roasted garlic, sour cream, milk, grated cheese, salt, and pepper to the potato pulp and mix well. Mix all the ingredients with the potato pulp. 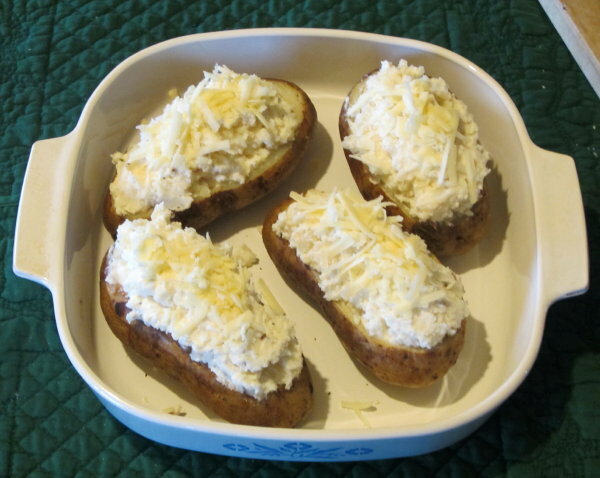 Spoon the mixture back into the hollowed potato shells and sprinkle remaining cheese on the top. Bake at 350 for 30 minutes to heat through and combine flavors. Potatoes stuffed and ready for the oven. 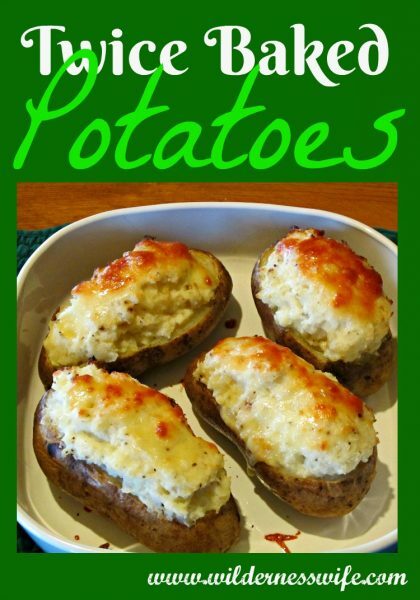 Voila ( a little French Chef flair there…lol) Twice Baked Poatoes……YUMMY!!!!!!!!!!! 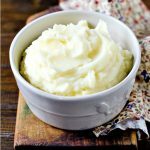 If you are watching your fat content, you can substitute skim milk, low fat margarine, low fat sour cream and low fat cheese. 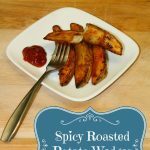 Try these potatoes! They aren’t difficult just a little time consuming but oh so worth the effort! Let me know if you enjoyed them! Talk to you soon! This recipe makes the common baked potato to a new elevated position on the dinner menu. You can vary the toppings by sprinkling some fresh chives or some tasty bacon on the top. Preheat your oven to 350F. Wash and thoroughly dry your potatoes. 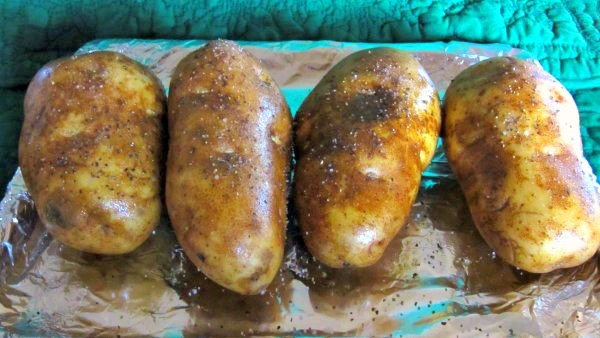 Rub each potato with olive oil and sprinkle with a dusting of salt & pepper. Place in a foil lined pan and bake in oven for 1 hour. Peel the 3 cloves of garlic. 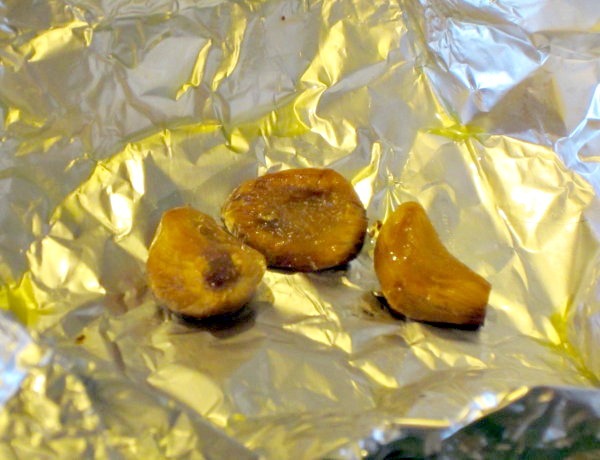 Place them on a square of aluminum foil, drizzle with olive oil and wrap them into a pouch. Place in oven with potatoes and roast for 20 minutes. Remove garlic and cool. When potatoes are done remove from oven and let cool so they can be handled. Cut the potato lengthwise, slicing off the top third of the potato. Set the top aside for now. Thoroughly mash the potato pulp. 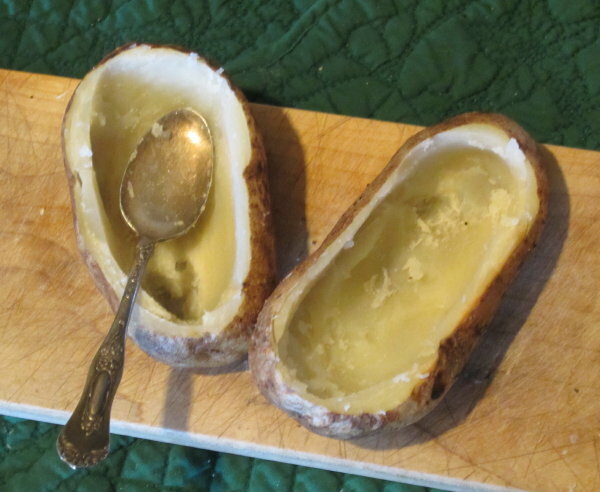 Spoon the mixture back into the hollowed potato shells and sprinkle remaining cheese on the top. Bake at 350 for 30 minutes to heat through and combine flavors. Thanks for sharing at the Inspiration Spotlight Party. Shared. Hope to see you again soon. 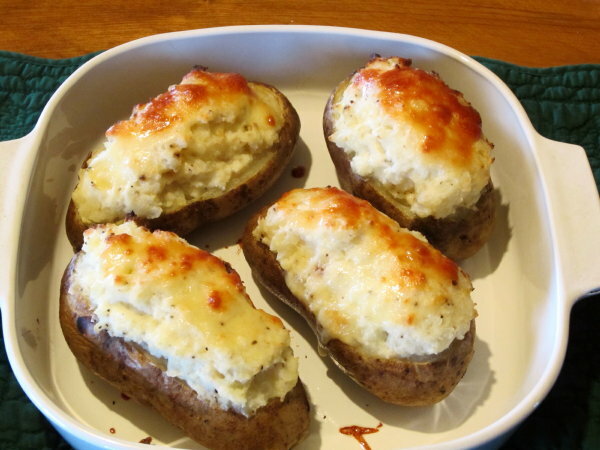 I really love twice baked potatoes, I need to make them for dinner sometime instead of just regular baked potatoes or mashed. I always forget that it isn’t that much more work. Yours look tasty! You had me at potatoes!!!! I think I could live on them alone! Thanks for sharing at the Thursday Favorite Things Blog Hop! I LOVE twice baked potatoes! 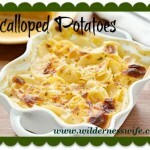 Today is menu planning day and this has inspired me to add twice baked potatoes to our menu next week. These are delicious! They have always been a favorite!